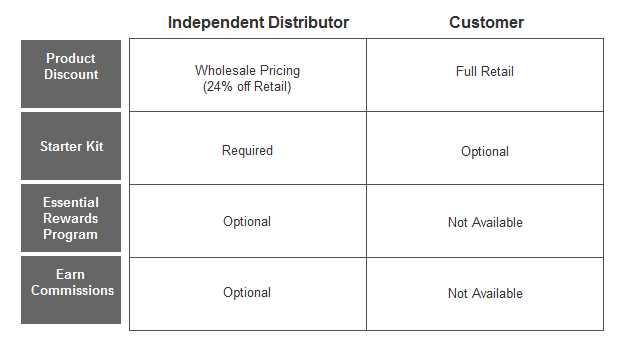 What's the difference between a Customer and an Independent Distributor? Ok, so what does this all really mean? What is a Member Number (also known as Independent Distributor Number)? Why does Young Living need my social security number for an Independent Distributor but not for a Customer? - The social security number is only required because an Independent Distributor has the opportunity to earn commissions. If a distributor earns over a specific amount, Young Living would need to report it to the IRS when taxes are filed. Once the social security number has been entered into Young Living's system, there are a limited number of employees that can view the number, for tax reasons. It is not available to view on file, and it is not used for any other reasons. any of Young Living's Products whenever you choose or however often you choose. - You simply buy the products just as you would buy anything online and pay full retail.